Beneath and behind the city we walk through is a past, present and future city. This book takes a trip into this metaphysical other place, conjuring pictures of things that might have been, things that were and things that could be. If this sounds deep don’t worry, there are a lot of laughs and curious stories on the way. There are more than fifty buildings and schemes covered in the book. Some made international news such as the rebuild after the IRA bomb in 1996. Others were sensations such as when Picasso’s Guernica appeared in a Manchester garage in 1939. There are halls, sculptures, commercial buildings, churches, shops, underground canals, bridges, theatres, views, valleys, cliffs and the story of the changing skyline. Oh and travelators. Naturally. We’ll meet the extraordinary Thomas Witlam Atkinson and Miss Norris as Snow, Miss Orrell as the Moon, Miss Shuster as Ice and Miss Entwistle as Night. Boy scouts will defend us in the 1910 Battle for Manchester. There are two hundred pictures, maps and images, many of which have never been seen in books, exhibitions or even online before. The author is Jonathan Schofield, a well-known Manchester guide, writer and broadcaster. 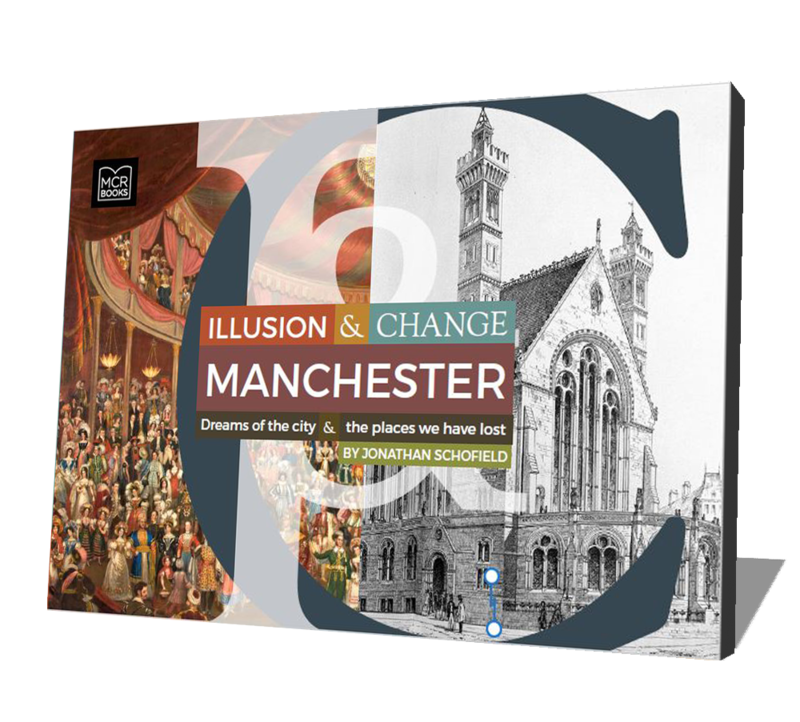 Illusion and Change is the sister of Lost & Imagined Manchester (£16.99) which came out in November last year and is being reprinted, having sold out in 7 months.